A year ago, following Michigan's 30-27 double-overtime loss to Ohio State, Jim Harbaugh was fined $10,000 for his post-game comments regarding the game's questionable officiating. 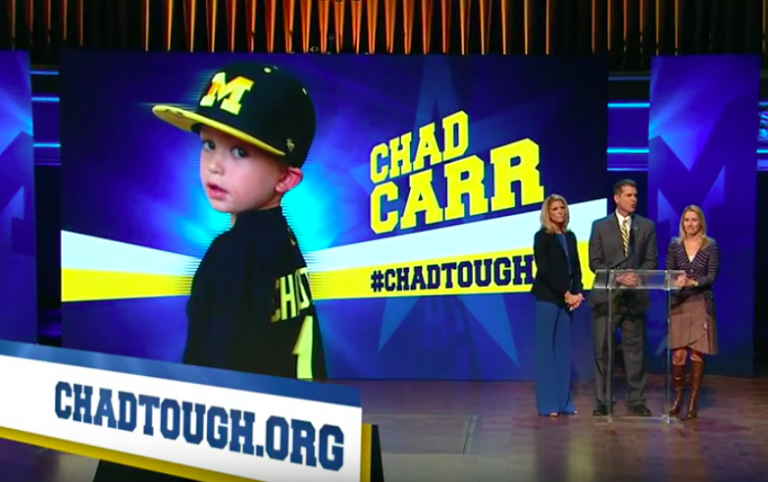 Michigan football blogger Justin Potts from Maize & Go Blue decided to try and turn a negative into a positive by creating a fundraiser to match that $10,000 fine with donations to the ChadTough Foundation which raises awareness and money for DIPG research. Last week, November 23rd, marked the two year anniversary of Chad Carr's passing after a heroic battle with this dreadful disease for which there currently is no treatment. Justin, along with myself, Kerri from SupportUofM and Craig Barker from The Hoover Street Rag are making this an annual event. Last year our goal was to raise $10,000. In just one week, we surpassed $28,000 in donations of which 100% went directly to the ChadTough Foundation. The loss to OSU a year ago was hard, but the fundraiser instantly helped me get over the loss and like Justin said, turn a negative into a positive. Visit this link to fundraiser. And after you donate...SPREAD THE WORD! Tomorrow is Giving Tuesday. Please make it a point to check out the ChadTough Foundation and the amazing work being done by them. DIPG is an absolutely horrible disease. However, in just a couple short years, new research has uncovered some incredible discoveries. Discoveries which may have not been realized without ChadTough! Thank you and Go Blue!